A game based on the premise of directing trains to their correct tracks, is unlikely to make the heart beat faster for most gamers; but then again aren't the simplest ideas often the best? Find out if the Train Conductor game series is worth your time - all aboard! Most gamers would have scoffed, if you'd told them a year ago, that a game of shooting birds to kill green pigs would be the best selling iPhone game of 2010 - yet it was. Angry Birds is a simple idea , yet it has turned into a gaming sensation. The Train Conductor game series for iPhone, is in the same genre of game - a simple enough idea and controls to master, yet ridiculously addictive and compelling. The basic idea is simple enough. You have a location with a number of tracks on it, that are given either a number or a letter; when the train appears it too has a number or letter on it, and the idea is to slide your finger from the train to the correct track, thus putting the train in the right direction. The game ends when the trains either crash, or fall into a gap in the track. When you start out playing Train Conductor, or Train Conductor 2: USA, you are given just one location to master. Once you reach a certain score, another location is added. It doesn't take long to get all the locations showing on your map though (took me about an hour), so soon you have a diverse choice of locations. The levels start out gentle, but get more difficult and complex as you continue, with added challenges, faster trains, and more tracks to control. The longer your game stays on a level the harder it gets too - there is no way to "win" or complete these games - you just keep going until you beat your last high score. The pace of the trains gets so frenetic that in the end you will surely "crash". Some of the levels work better than others, and they all have quite a different feel to them. The Grand Canyon level on TC2, for example, involves you building track over the canyon so the trains can cross - as well as the number of tracks increasing, there are added difficulties such as trains that won't stop at the edge of the track, and different lengths and speeds of train to control. The frequency of trains is also higher, which requires some quick and intuitive thinking, moving a train from one track before you can direct another one to the same track. Each level on both the Train Conductor games, is based on a different location. The original game features a map of Australia and so the levels are themed around these locations, although the USA locations in the Train Conductor 2 game make more sense (for the most part); you have the monorail in Miami, the subway in New York City, and mining trains running amok across the Grand Canyon. There are some themes that just make no sense though. 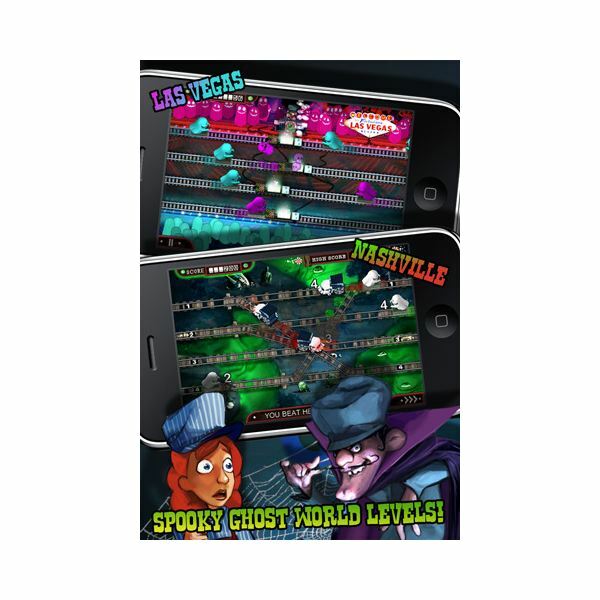 The Las Vegas level is a good example of this, as the trains featured are "ghost trains" (actual ghosts that you have to direct to the relevant colored area). There is so much scope with using a Vegas theme, I wonder at the idea behind this. Much is made of the new "Roswell" level too, but apart from one small difference in gameplay, it looks exactly the same as the Nashville level (another ghost theme, by the way) - not an alien in sight. Graphics aren't what you really buy a game like this for, and they are pretty basic, yet retain a certain appeal. More realistic imaging would have been preferable, but the game is none the worse for not having it. Some levels are much more visually appealing than others - waves washing up on Miami beach are a nice touch, and the gold mining trains of the Grand Canyon add a certain sparkle too. Each location also has its own music, which genuinely does add to the feel of the game, from a pure country sound to the more urban beats of the city. For my money (99c, 59p), the Train Conductor game series is way more addictive than the more popular Angry Birds, as it requires skills of speed and using your intuition and problem solving skills too, rather than just mastering a particular angle. 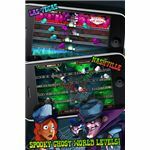 It is also a game that just keeps on going, so you will still be trying to beat that high score in a year's time, whereas with other iPhone games of this type you'll give up when all levels are completed.